As of today, the iMac I’m writing this on is 1 year old. At least to me as that’s when I bought it. Anyone who has purchased Apple kit will know that you get a 1 year warranty with new Macs. I’ve used this once previously to get the Superdrive in my iMac G4 replaced just before it ran out some seven years ago. My second experiance with Apple repairs came with my current iMac. I had been noticing some dark spots on my display in the past month or so and they started to get worse. A look on the Apple discussion site showed that lots of people were having this same problem and getting the displays replaced. I thought I better get on that before my 1 year passes by. I called Apple and got an appointment booked for very early last Saturday morning to drop my machine off at the Apple Store in Westfield Stratford (no, I’m not going to call it ‘Stratford City’). 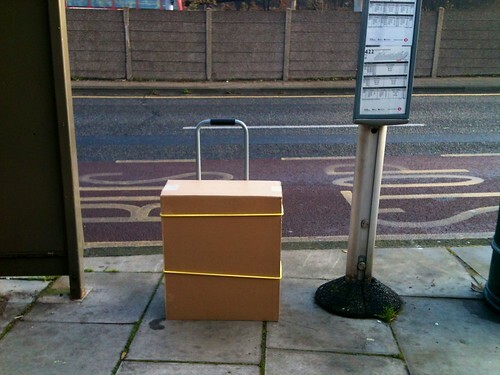 Now I had to work out the logistics of getting it there. 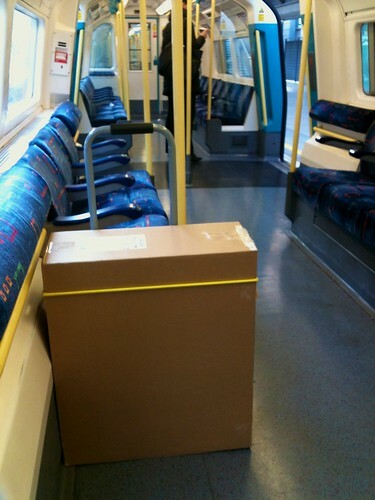 I brought my iMac home last year during a Tube strike. I was just that determined to have it for the weekend. It took some time for my arms to forgive me for that. 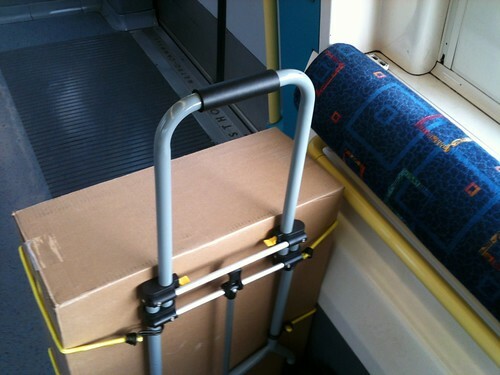 Not wanting a repeat of the arm pain and headache of lugging around a large box, I picked up a wheelie hand cart and some bungie ropes. This time I was going pro. It paid off. The trip to drop off the iMac was a breeze! The gal at the Genius Bar booted it up off the network to run some diagnostics on it (I always reckoned that used some NetBoot stuff at the Stores), had a look at the screen and marked it down for replacement. Nice! 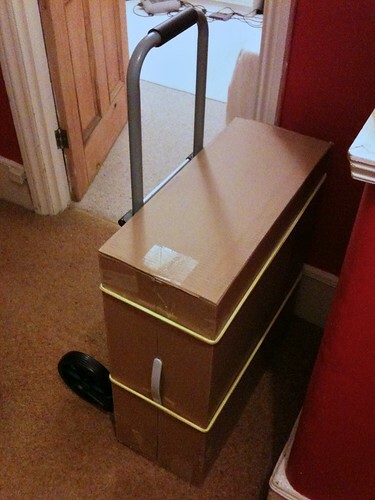 And the staff were impressed with my pro setup to transport it. All in a usual day’s job for me. 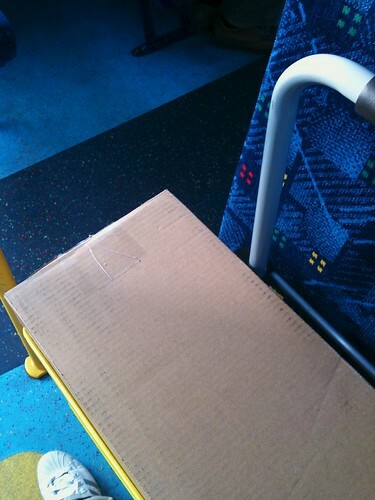 Empty box on a nearly empty Tube. I got the call a few days ago that the work was all done and it was ready to collect. I didn’t have the time to pick it up until Sunday afternoon and/or evening. There’s no way it was going to be as quiet at that behemoth temple to shopping at that time of day. 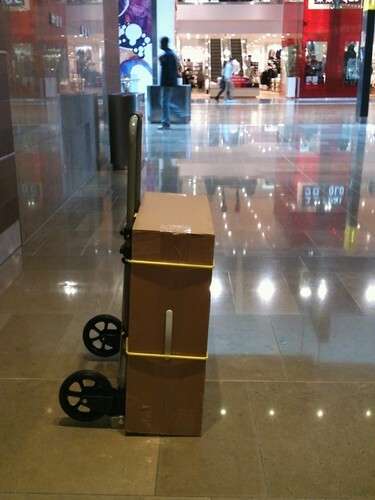 I braced myself and headed out today at 4pm, empty box and hand cart in tow. The bus ride and tube journey were fine. However, Westfield itself was teeming with people. People not watching where they are going. People walking into the box I’m trying to politely wheel about. Then there was the queues for the lifts. Oh lord. You’d think people never used a lift before. The one going up would fill up, and people would keep pushing the up call button, which of course then just made the doors open of the one that’s already full. I snapped and said ‘someone has to stop pushing the call button’. The message got through. The service at the Apple Store wasn’t as top notch as last week. Too many 19-year-olds manning the Genius Bar. And by manning I mean, standing behind the bar talking amongst themselves, giving me and the large box beside me the odd glance and ignoring my ‘hello’s. I finally got served by a guy just passing who went and got my iMac and tested it for me. Huzah! But bless him, he had no idea how to lift one back into the box. I showed him a better way to do it. He said ‘wow you must do this a lot’. Yes, yes I do. Right! Back through the masses to Stratford station to get on the Jubilee line. But what’s this? The platform gates are being shut and guarded by British Transport Police. Arse. A power failure meant Jubilee line trains weren’t going anywhere. Decision time: do I hang about and see if it will get sorted soon or chance wheeling my cargo to the DLR to Greenwich and then on an overland train home. I figured I’d give the DLR a go. No trains to Lewisham. Arse. Canary Wharf and a change of trains it was. When we got to Canary Wharf there was an announcement that the Jubilee Line was running again. D’oh! All in all, I got home a couple of hours later. It was a hassle, but to get a £299 screen replacement for £0 I think it was worth it. 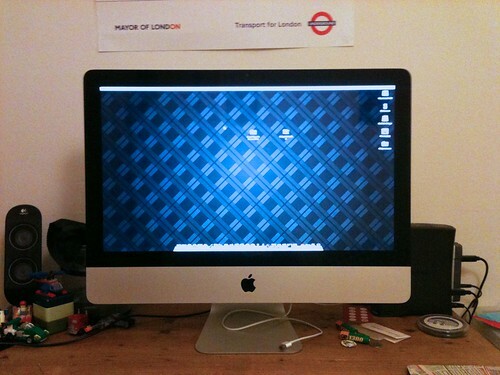 Here’s to many more years of reliable service from my favourite lil’ iMac. 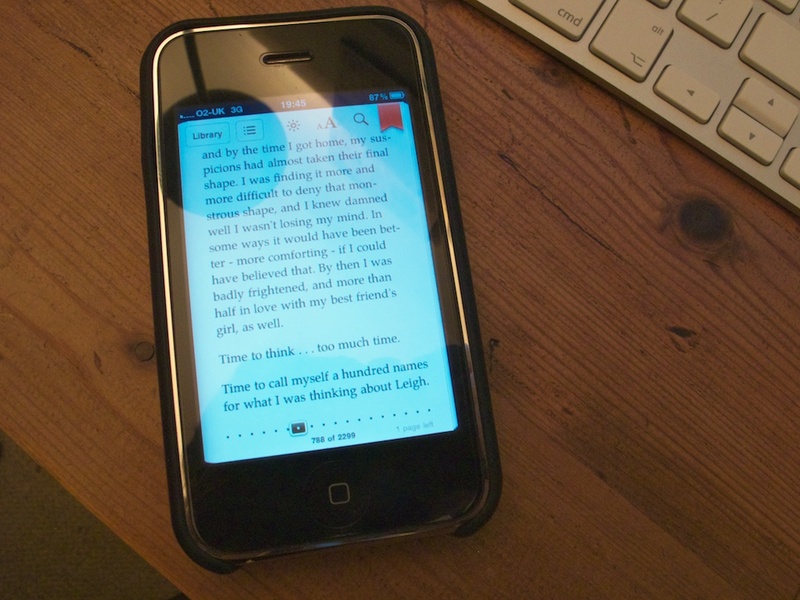 I always thought the iPhone screen was too small to read an actual book on. Much like how I previously thought the screen on a Gameboy Micro was too small to be of any use or to be enjoyable. And just like the Gameboy Micro, I’m found I was wrong. I really should put away any preconceptions I have of small screens being too small. Recently I’ve been wanting to revisit some of the Stephen King books that I read when I was in my teens. I kept an eye out for any used copies but no joy. This past weekend I thought what the heck, I’ll download a few and maybe try reading one on my iPhone. I’ve had books on my iPhone before but never got more than a few pages in. I’m not sure if it’s what I was reading or the previously mentioned bias that the screen was too small. I loaded up my phone with Christine as that’s the one I remember the least about (other than it’s about a nerdy guy and his car). Once I started reading I was hooked. And it was great as the ‘book’ as it were was always in my pocket no matter where I was. Don’t get me wrong, I still adore the form factor of the humblest of books. But it is incredibly handy to just slip your phone out of your pocket in a jam packed train rather than having to riffle through your bag to fetch out a paperback. There’s loads of free books / ePubs you can get that will work with the iBooks app from Google Books and Project Gutenburg. Last Thursday I got an email saying that I won a spot at the iTunes Live London Festival to see Annie and Sam Sparro on the 21st of July. Woo! I didn’t even recall entering a contest, but apparently I did. The iTunes Live hoo-ha is a month long music festival of sorts put on by Apple. A different act (or acts) every night at KOKO in Camden which are all recorded and available on the iTunes Music Store at a later date. It’s a pretty neat idea. Plus, all the tickets are free… you just need to be picked. I headed into Liverpool Street Station right after work last night and then high tailed it to Koko. The doors opened at 7:30pm and I got there just a few minutes after that. The queue wrapped around to the back of the building but it moved impressively fast. Once inside, ticket scanned, iTunes Live passcard/lanyard in hand er around neck, it was time to stake out a place on the floor. I had never been to KOKO before and it lives up to it’s reputations of being one of London’s nicest music venues. The show was brilliant! It was great to hear some of Annie’s new tracks in full and Sam was so incredibly energetic and had a red key-tar which was used during mash up of Sick and Daft Punk’s Around The World. I was pretty close to the front, but as my luck always goes three tall chaps ended up in front of me for Annie’s set. 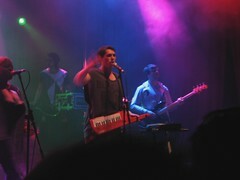 Thankfully everyone moved around a bit during the intermission and I had a better view for Mr. Sparro. A highlight from the intermission – a big screeen appeared that was showing a promo clip for iTunes Live material on the iTunes Music Store. One of the clips showed Amy Winehouse from last year and someone tossed a drink at the screen. No love for the Winehouse in Camden Town. Sadly I had to leave during Sam’s encore which started off with a cover of Blackbox’s Ride on Time. Alas, I had a train to catch. Hey I can always download it using the voucher code that was on the back of the pass card. What an age to live in. I had an enjoyable sit down outside Liverpool Street and munched on some chips. I took a few snaps of the street before getting the 23:28 train to Cambridge. Cracking good night all around. Some photos are up on Flickr and I have video clips to upload as well. Tonight I finally did it. 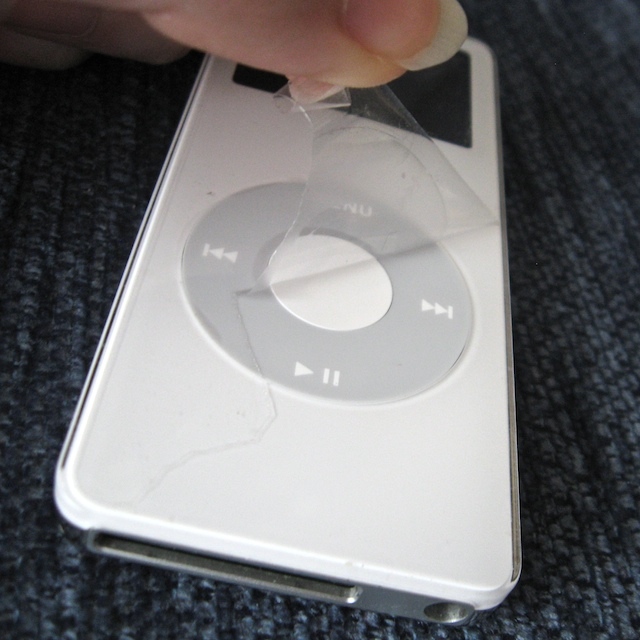 I removed the plastic film from the front of the 1st generation iPod Nano I got in late October 2005. It was a bit rough going. It had a bit of time to get really stuck on there so it came off in pieces. Imagine my surprise when I saw the iPod Classic I got last fall didn’t have the same protective cover! Yep, the cover on the Nano even outlasted an iPod upgrade. I’ve started using it again though as it’s tininess is rather handy.